A Hillsboro police officer was honored Monday for his efforts to save the life of a suicidal citizen last month. 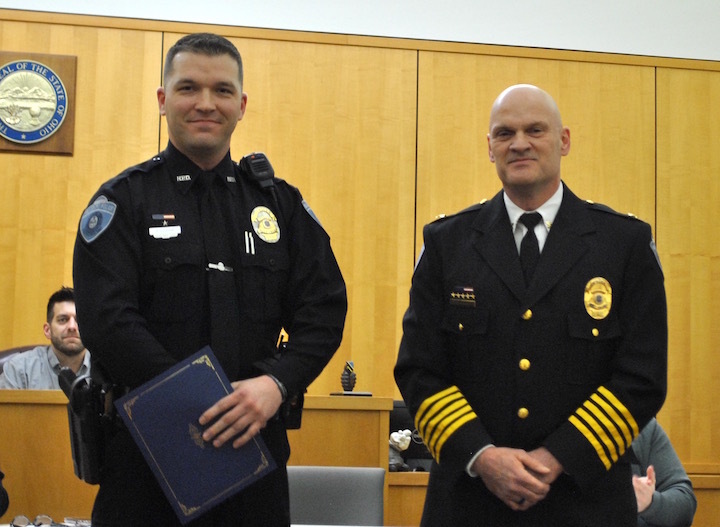 Hillsboro Police Chief Darrin Goudy honored Officer Andrew Gosink with a letter of commendation during Hillsboro city council’s Feb. 11 meeting. Goudy praised Gosink for his actions during a situation that the chief called “hazardous,” referencing the recent death of Clermont County Sheriff’s Office detective Bill Brewer, who was killed Feb. 2 after responding to a report of a suicidal male. “Our officers are called upon to protect and serve,” Goudy said. “One of the most hazardous ways they can do that is dealing with an individual who has decided that they no longer want to live in this world, as we can attest to this past Friday, when we had to lay one of our own to rest who in that very same scenario was trying to serve somebody who was trying to end his life and instead took a detective’s life. According to Goudy, Gosink, with assistance from Hillsboro police Sergeant Shawn Kelley and Paint Creek Joint EMS/Fire District crews, responded to a report of a suicidal female in January. Upon arrival at the woman’s residence, Gosink found a car running inside a closed garage, then discovered the female locked inside her bedroom. “Officer Gosink discovered the female sitting on her bed with a knife at her throat,” Goudy said. “He began talking with her and tried to calm her. He discovered that she had a dog and began to talk to her about her concern for her pet. She indicated that she only trusted one person to take her dog, so Officer Gosink convinced her to write down the individual’s contact information. Gosink has been an officer with the Hillsboro Police Department since February 2017.